PHILLY BOXING HISTORY - October 02, 2010 - Briscoe Awards Monday Night! On Monday, October 4, 2010, the 3rd Annual Briscoe Awards will be presented at the VBA Club in Philadelphia. 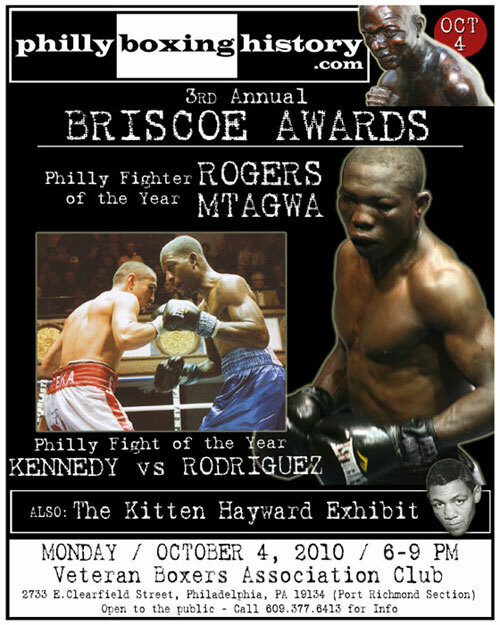 Rogers Mtagwa will receive the Briscoe as "2009 Philly Fighter of the Year", Teon Kennedy vs. Francisco Rodriguez will be acknowledged as the "2009 Philly Fight of the Year", and amateur star Miguel Cartagena will take home the "Everett Brothers Award" as the outstanding amateur of 2009. 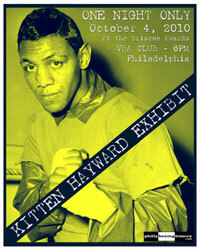 Also presented Monday evening will be "The Kitten Hayward Exhibit", a collection of photos, posters and artifacts celebrating one of Philly's best. The event is FREE and open to the public. Parking is available on the street and in a free lot located at Clementine & Thompson, just a few blocks from the VBA Club. Everything gets started at 6:00 PM on Monday, with the awards handed out around 8PM. For more information on this event, call John at 609-377-6413.